I have been raising sheep for over 30 years. 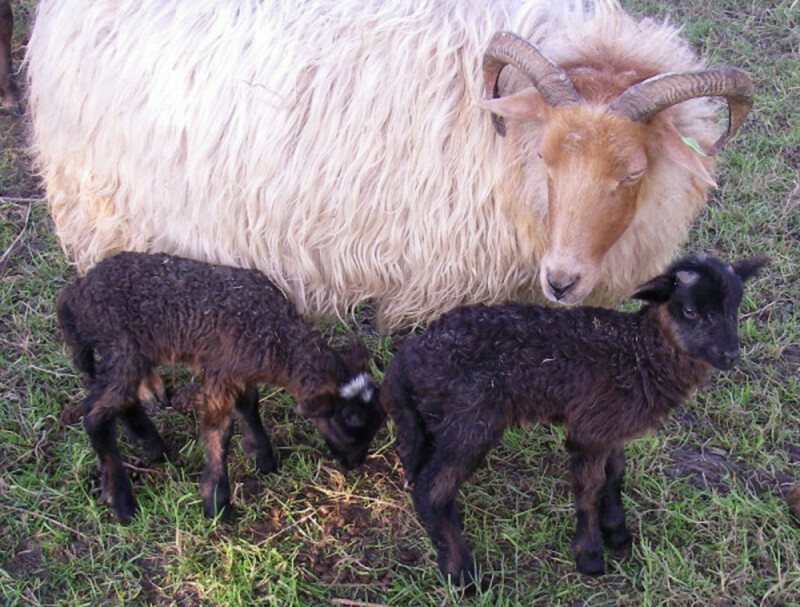 The oldest Dutch native sheep breed is called Drenthe Heath Sheep. 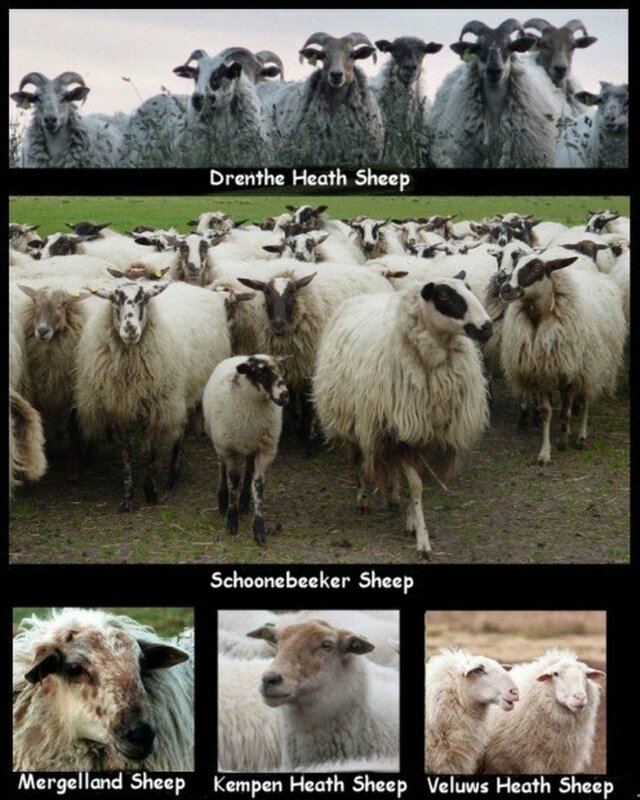 The Netherlands has 5 different native Heath Sheep breeds of which the Drenthe Heath Sheep is the oldest. These sheep were roaming our country as far back as the 14th century. It's the only native horned breed in my country, rams have rather big horns and ewes can be horned, hornless or have sticks. This sheep breed can survive harsh winters, is multi-colored, self-supporting, and is the most beautiful sheep breed I know. They're still very close to nature and hardly lost their natural instinct. I've been raising these sheep for over 30 years now. These Sheep Are Kept in Big Herds or in Small Flocks. Sheep are one of the oldest domesticated farm animals. 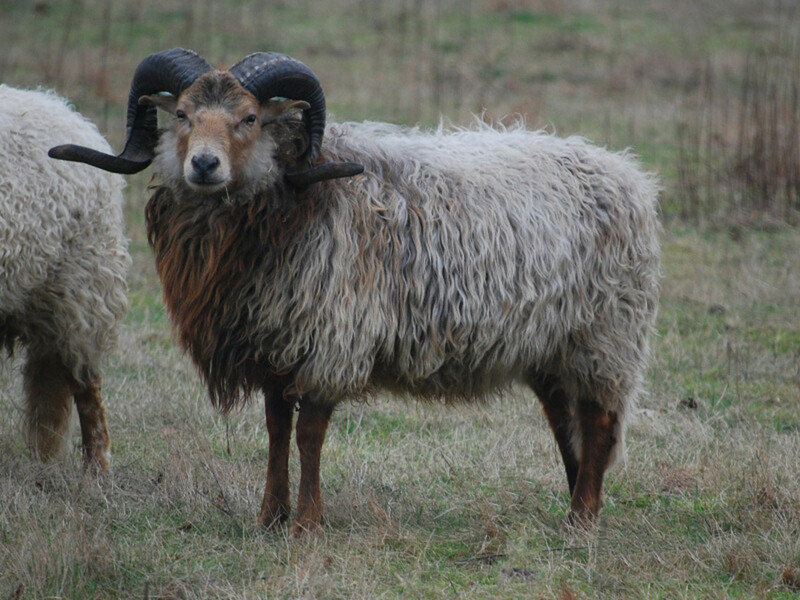 The Drenthe Heath Sheep is the oldest breed of mainland Western Europe. 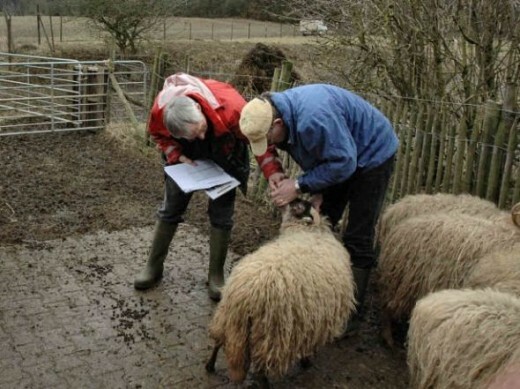 Sheep with great similarities were found in the Dutch province Drenthe as far back as about 4000 BC and probably came along with French immigrants. This breed is, therefore, the last remnant of the way sheep were kept as far back as 6000 years. In the old days, the Netherlands was covered with big heath fields of which you can still find larger and smaller areas scattered throughout the country. Contrary to the more improved breeds, these sheep are capable of surviving on the arid heath fields. 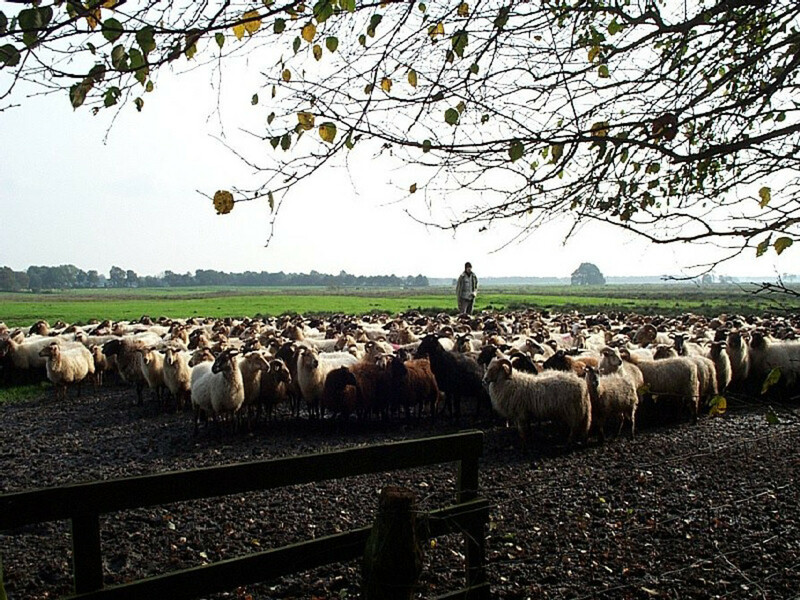 In the last centuries these Drenthe Heath Sheep have contributed in a large way to the improvement of Agricultural grounds. Why Is Breed Named After the Province of Drenthe? 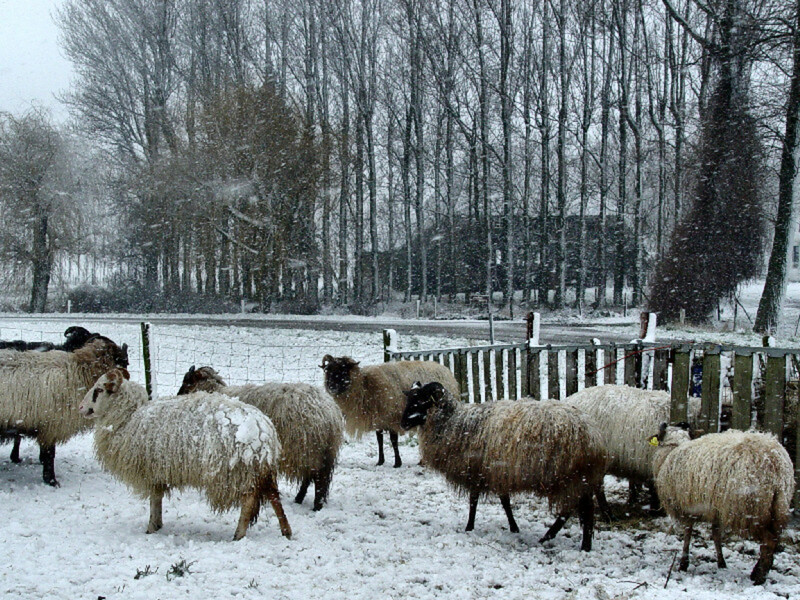 The Drenthe Heath Sheep were named after the Province of Drenthe in the Netherlands, because it was there that they were found most in the old days. Drenthe is the province that still harbors the largest heath fields today. Selection occurred mostly in a natural way. The most hardened sheep survived, just like it happens with animals living in the wild. Ewes that rejected their lamb got slaughtered for food. Those sheep needed to have endurance because they had to roam the heath fields for hours and hours to get their bellies filled. 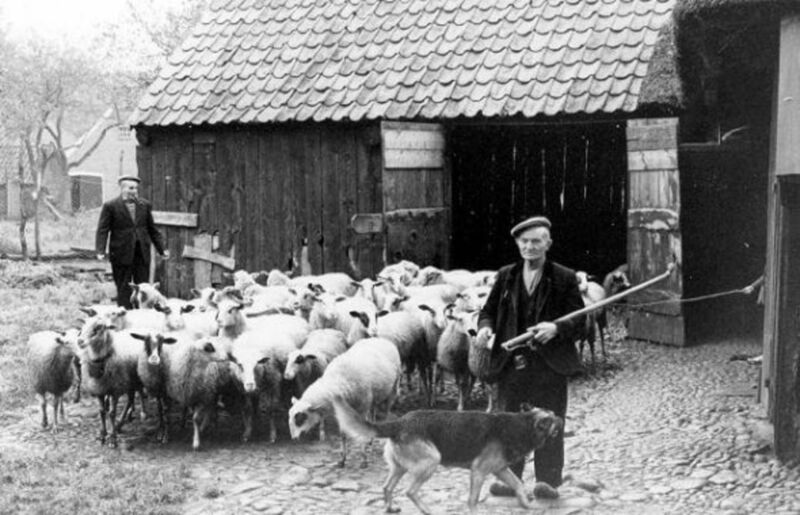 The farmers in Drenthe were poor people and the soil in the Province of Drenthe wasn't the best soil to grow crops in, so they had to fertilize it a lot and they used the sheep to do that. Artificial fertilizer hadn't been invented yet. During the day the sheep of different owners were joined together and the shepherd and his dog wandered off all day across the heather fields so the sheep could eat their belly full. At night they were brought back to their rightful owners and put into the sheepfold, in which they had spread cut peat. The sheep would poop on the cut peat which was layered over and over. Those sheepfolds were deep litter houses. At the end of winter, they got the manure out and it was spread over the land. When it wasn't too cold and freezing, the sheep slept outside on the land. Each farmer had a smaller or bigger herd of sheep. 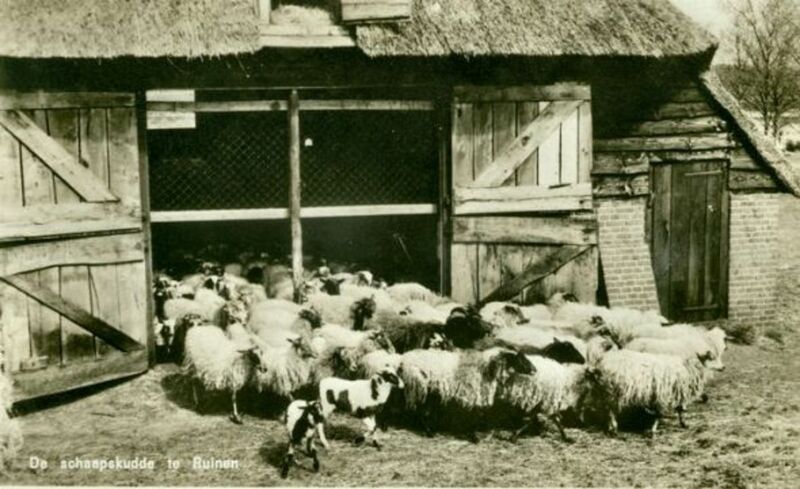 After the invention of the artificial fertilizer in 1903, the Drenthe Heath Sheep lost their economic value. They were not the number one fertilizer "machines" anymore. As this breed is rather small and slim and was not developed for producing a big load of meat the farmers were looking for another way to make more money out of their sheep. In the South of the Province Drenthe where the soil was quite a bit richer and more nourishing, they kept another sheep breed, called the Schoonebeeker . 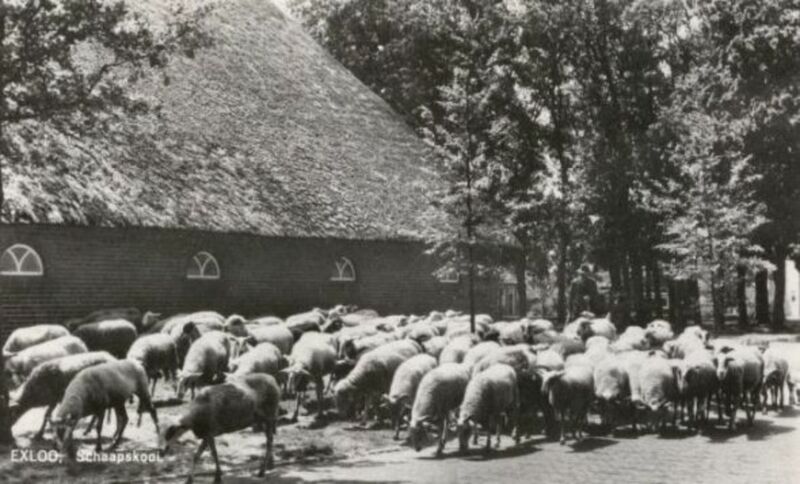 Farmers started to cross-bred their Drenthe sheep with those Schoonebeekers in order to get more meat which they could sell at a higher price. 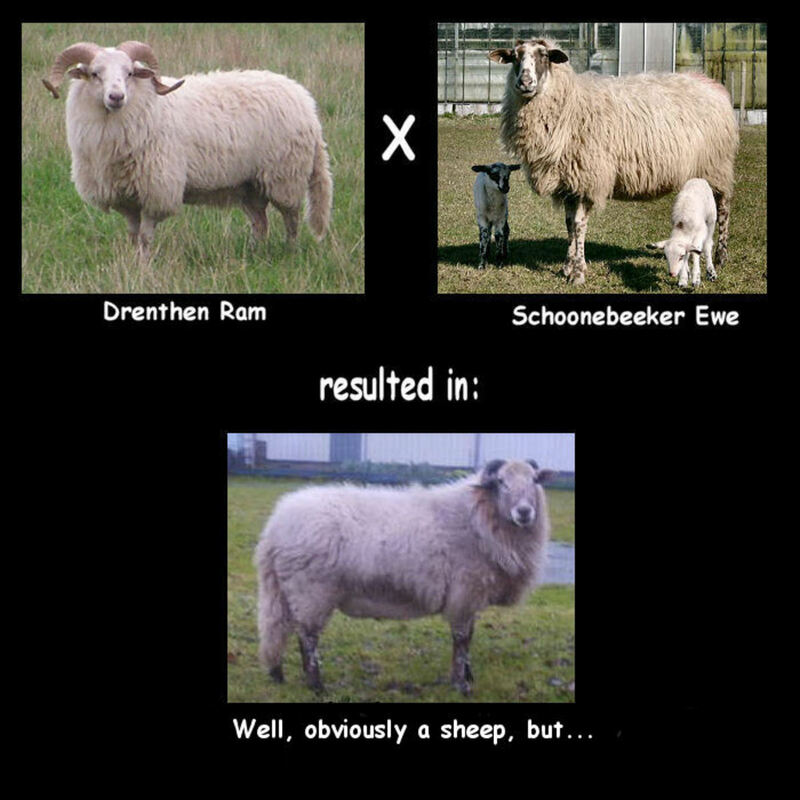 What happened was the development of a new type of sheep, which was heavier-built, which gave more meat on the lambs, but cross breeding is never a good thing for the original breeds. 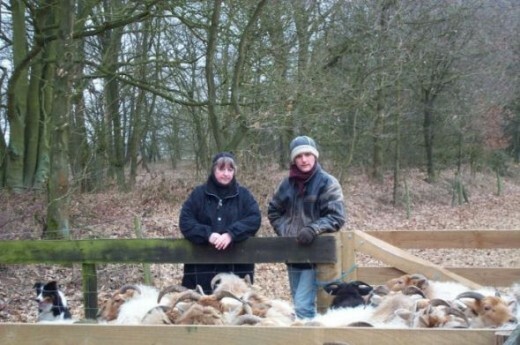 Slowly but steadily, the old type of Drenthe Heath Sheep and Schoonebeeker were disappearing almost to the point of extinction. 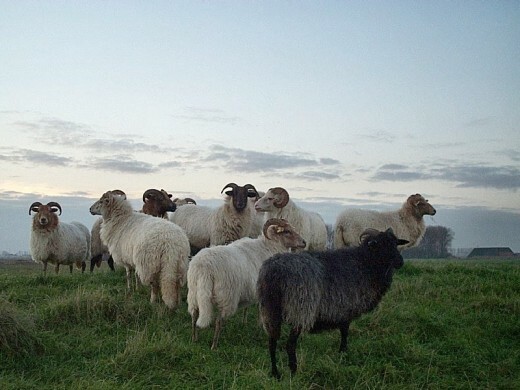 In 1977 a newly founded organization called Association for Original Dutch Livestock Breeds, made a country-wide inventory of what was left of the original native Dutch livestock breeds, including the sheep. The outcome startled them, because the Drenthe Heath Sheep as well as the Schoonebeeker had almost vanished beyond repair so to speak. 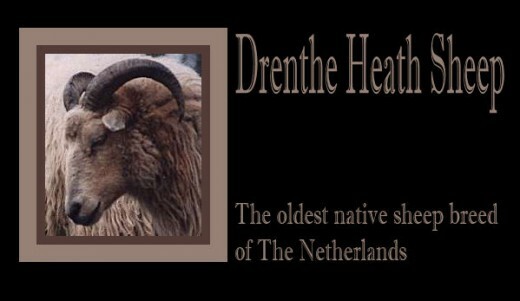 It took, however, another decade before the Dutch Breeder Association the Drenthe Heath Sheep was founded in 1985 and I was in it from the start. At first, it was an association only for the horned sheep, but within a short time, we were able to also take the Schoonebeeker under our protection, because it was a breed originated in the Province Drenthe too. A breed standard was made up from what we read/heard/saw of how the original breed must have looked like. Photographs were not available, only a few drawings, so we had to go with books (one antique book actually) and hearsay from very old shepherds. We started slowly with a wide breeding base. There weren't very many sheep of the old type left and we had to be careful with a too close inbreeding because that would have made things even worse. Each year a selection was made to rule out the bad ones and keep the good ones (or as good as they got at that time) for breeding and we have been doing this for the last 30 years. I've been breeding these sheep for 30 years now, have served 9 years on the board, I keep the International acknowledged pedigree book since 2000. One good thing about our association is that our sheep don't get prizes, our inspections are solely focused on breeding back and holding on to the healthy, self-supporting animals they once were. 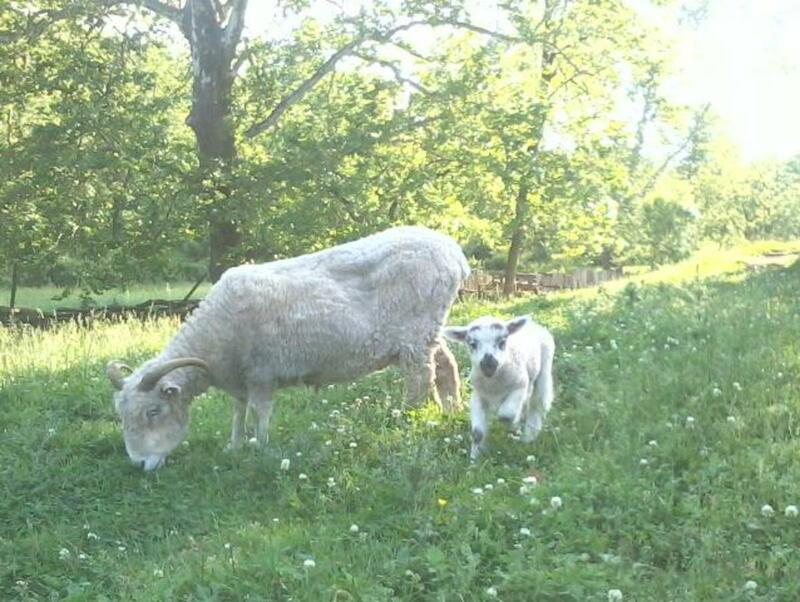 The health of the sheep and the natural necessity of being a good mom to her offspring are essential. We don't breed with lambs in the same year they're born in (we like to give them time to grow into their adulthood), the sheep can only be put up for inspection at the minimum age of 1 years old, and we don't do concessions to a specific color if the rest is below level. We don't accept that animals with inheritable failures are being sold for breeding to other breeders. Breeders can get banned from the association if they keep on breaking the rules. 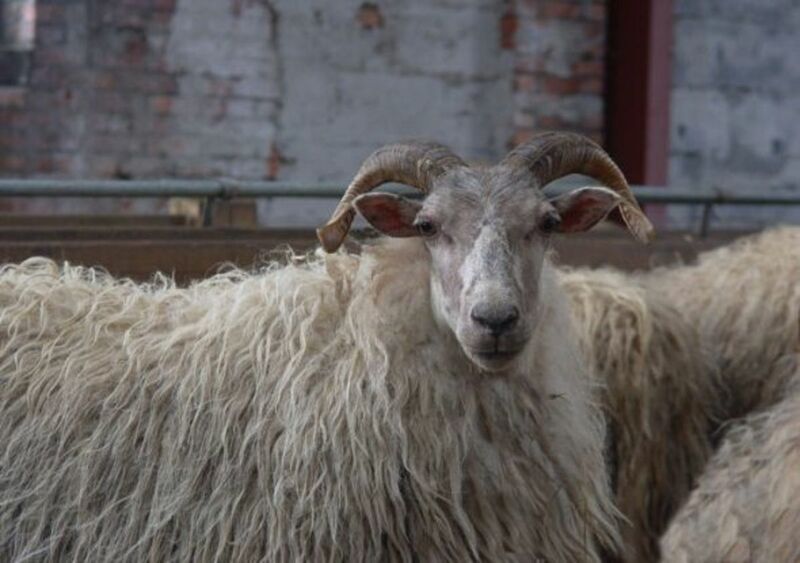 In 1984 I came across this native Dutch sheep breed and fell in love immediately with their beautiful appearance and their intelligence and the fact that I could help to preserve these sheep for the next generations. I started with two ewes and one of them got twin lambs. However it didn't take too long before they grew into a small flock. 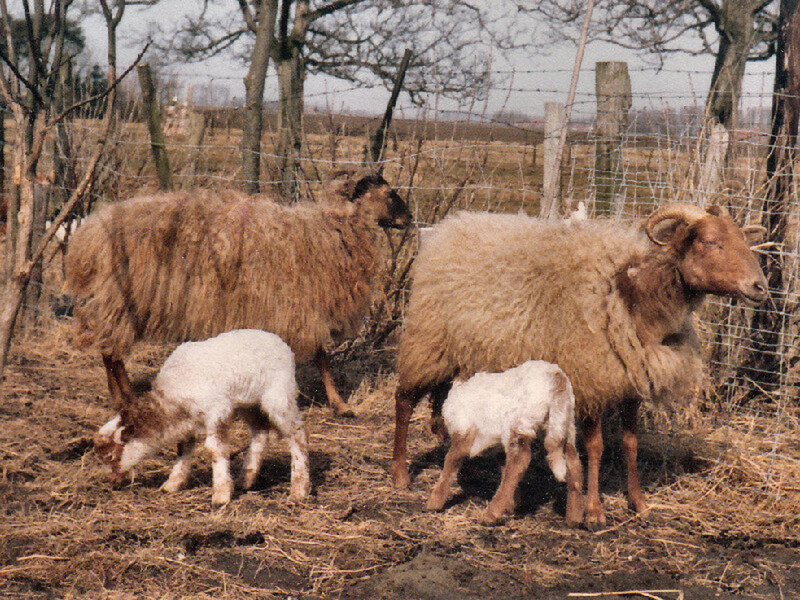 The Drenthe Heath Sheep are multicolored. This means that each ewe and each ram have all colors in their genes and what colors will merge into the offspring is always a surprise. Some colors are dominant (fox color), others are not (black and white). Furthermore, there's a great variety in some colors, especially in the blue fox and the badger face colors; they range from very pale to very dark. The color name depicts only the color of the head along with the color of the legs. 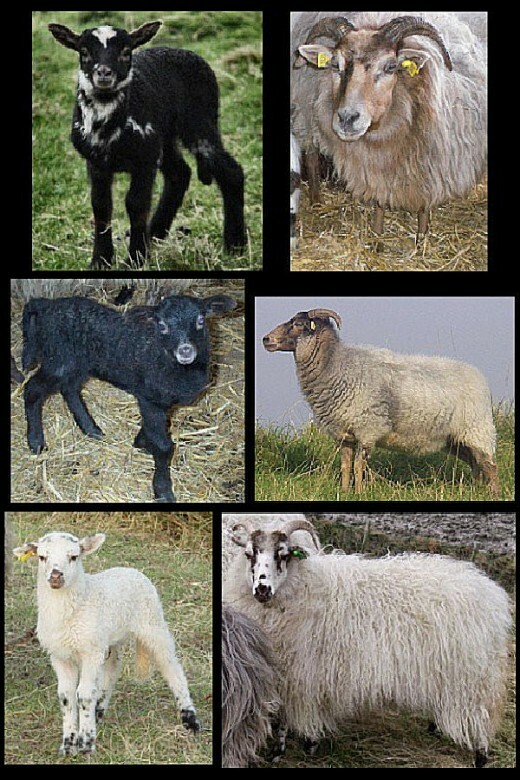 Except for the real black sheep, every other colored lamb will get a grayish white fleece when they're grown up. Colors are set at the first inspection at the age of 1, and 5 years of age because sometimes the color will change during the first year of their life. 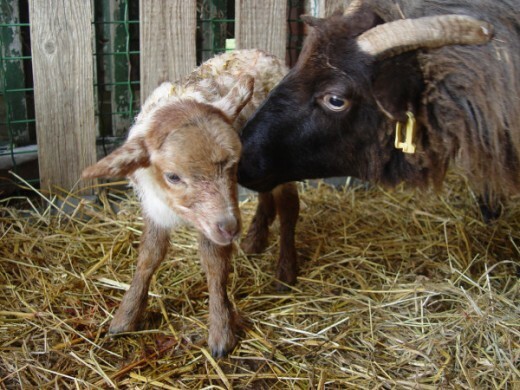 Below, I'll show you a few photos with an embedded small photo of how the adult ewe/ram looked when she/he was born. I'll also show you photos of ewes with their offspring. 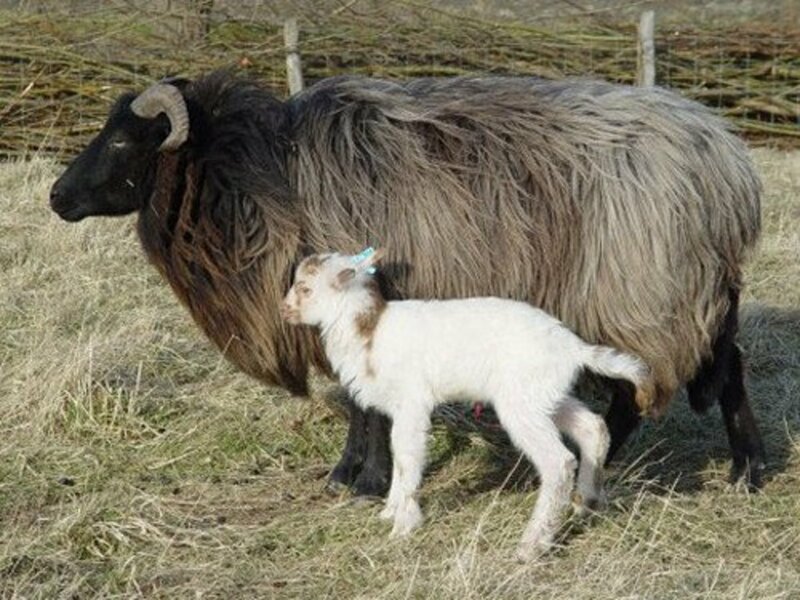 You can't breed on color with this particular Heath Sheep breed. Every ewe and ram have all colors in their genes so you can never predict the colors of the lambs. 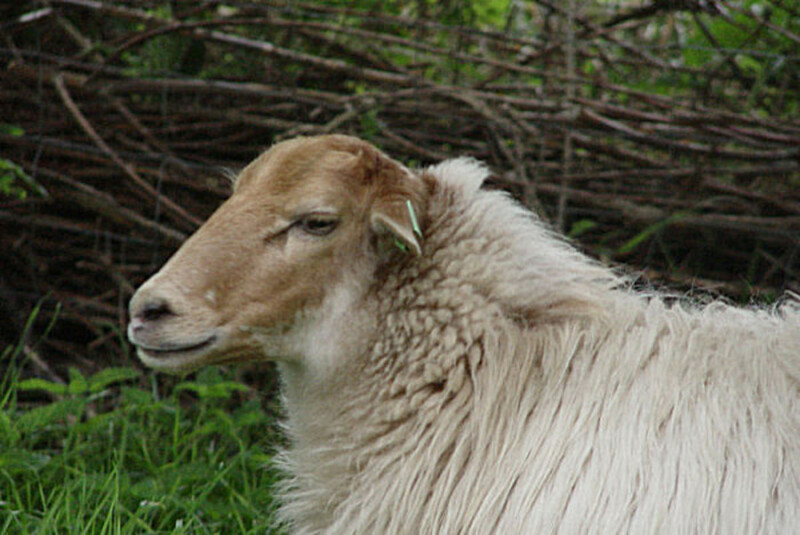 The Drenthe Heath Sheep is an intelligent sheep. 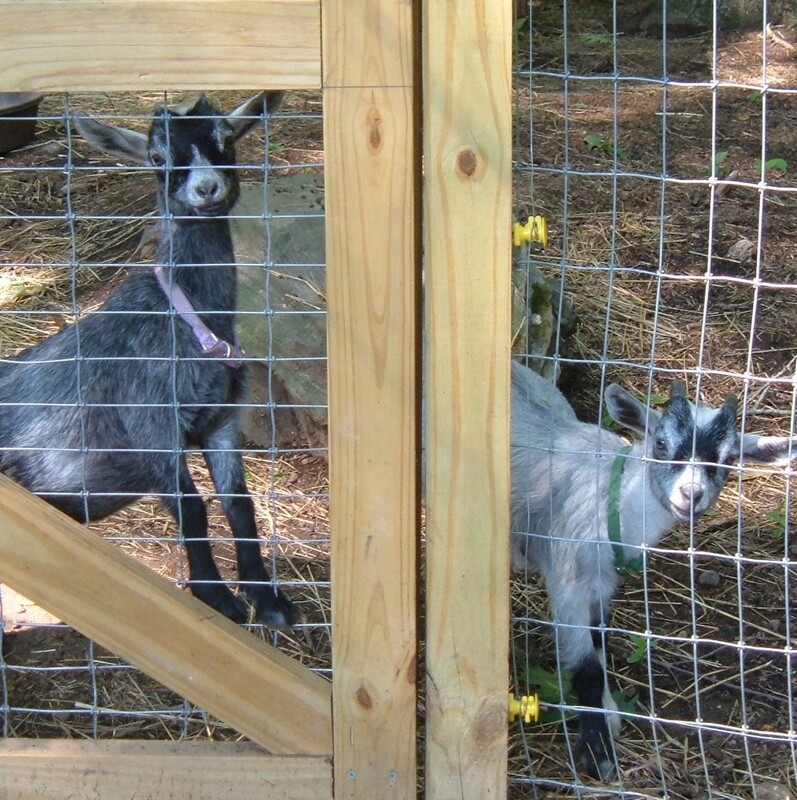 They will find every weak spot in the fence, they can jump from standing position over a 1.20 meter (47") high fence if they want to or are forced to. They have a strong herd instinct and a strong order of ranking and will always follow the leader. They can be loud too, especially the ewes in the winter season, when the pregnant ewes get their concentrate. They're insistent nagging ladies when they want something. I compare them often—as a joke—to women on a sales event, working with their elbows, all wanting to be first, but I love them to pieces. I'm completely hooked on this ancient, rare Dutch breed. Officially, we can't export them to other countries due to some silly government rules which we are unable to meet. The sheep are lacking a specific genotype that prevents them from getting a certain disease, even though this disease has never ever been established in this breed. The breed apparently has some kind of natural resistance to some diseases that hit the manipulated, overly crossbred meat productive sheep breeds frequently. The government, however, doesn't make exceptions. 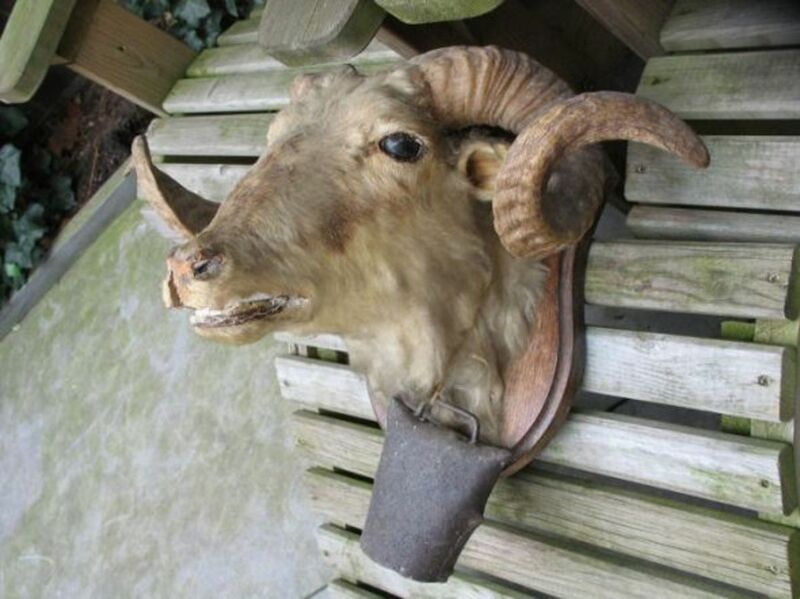 In 2015, we got a telephone call from a man telling us that he found this stuffed sheep head when cleaning out his parent's house after they both had passed away, asking us if it was a head of a rare Drenthe Heath Sheep ram. The story behind it was that his parents got this stuffed head as a wedding present in 1923. This was our lottery ticket, because now we have a "living" example of how the old type Drenthe Heath Sheep rams really looked like in the old days. We also now know that we still have a long way to go, but the path is clear. 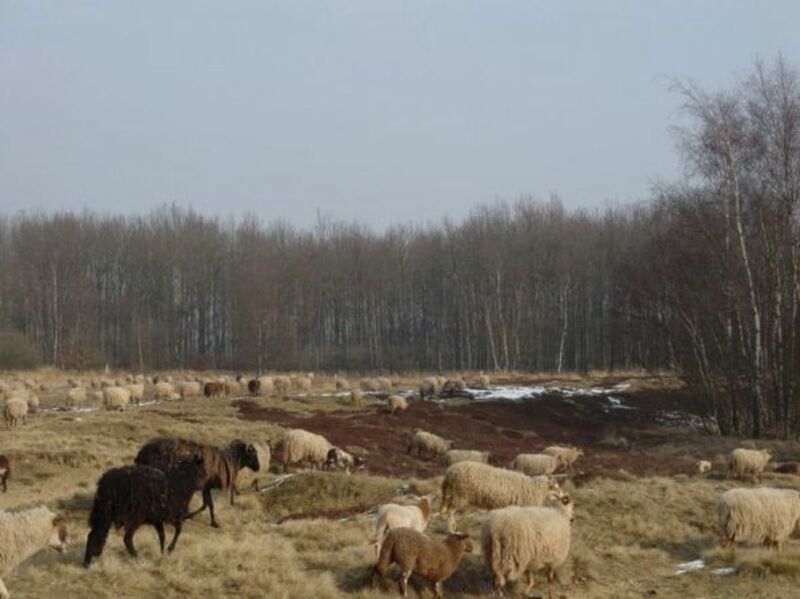 Today (2017) we have about 22 big herds of Drenthe Heath Sheep and Schoonebeeker Sheep and about 150 small(er) breeders within our association. 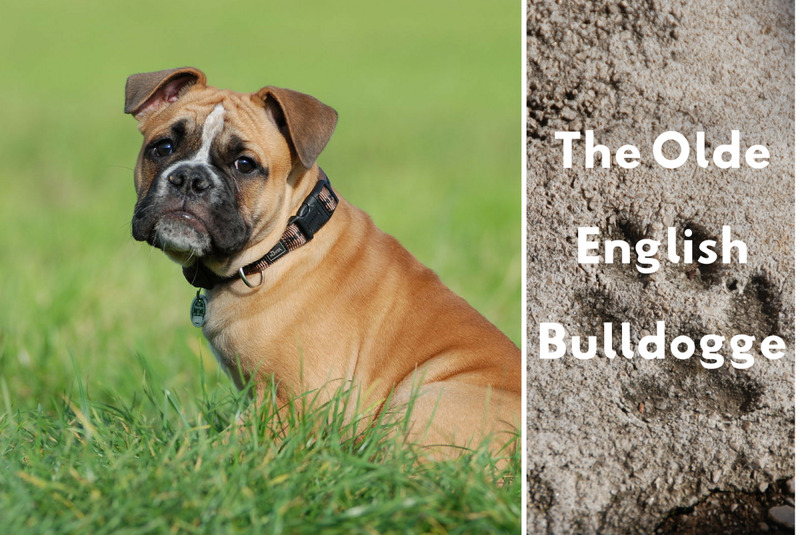 Olde English Bulldogge Information and Facts: Is This Dog Breed Right for You? Hello Alice Logan Cooper, if you go to my profile page you can contact me by hitting the contact button below my name. 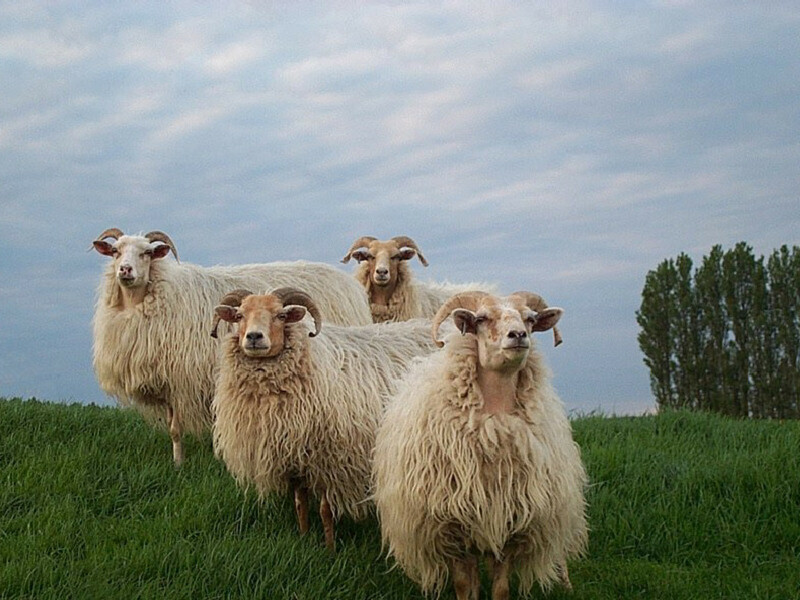 As a knitter and weaver, love the info on the Netherlands sheep breeds. in the fields. I wonder if there's any written info to obtain on the breeds. Very interesting article about your sheep. I wandered over to your page after following the sheep-naming thread. Their expressions make them look very intellegent. As a knitter, I'd like to have some sheep and angora rabbits some day. My favorite sheep are Jacobs--with those extra horns, they look like something out of the Revelation! Very nicely done. I learned a lot. Thanks! What an interesting article! The photos are beautiful, full of great information too. I watched the drum carding video, and it was even more interesting than I thought it would be. Nice lens, thanks for sharing. 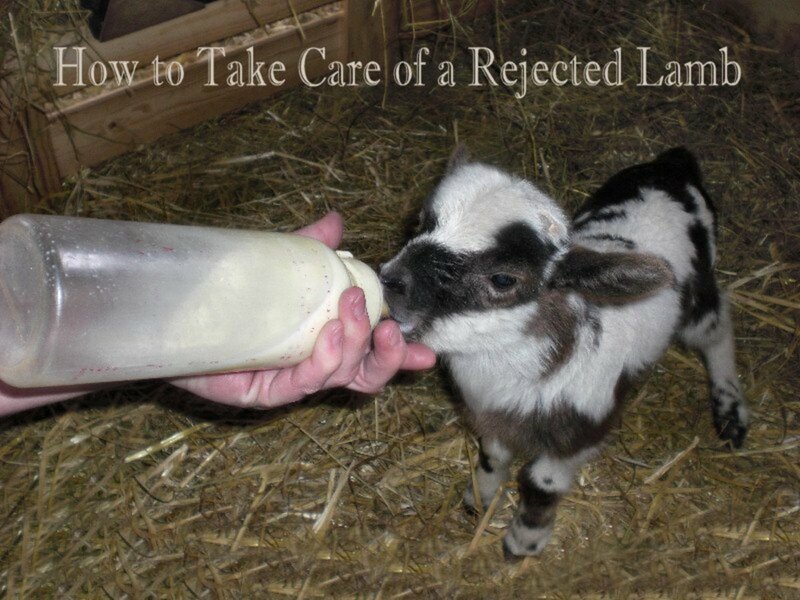 Lovely reading about this rare breed, I'm glad you shared it. I can understand the reason for restricting export of the sheep; I think the breed would change if it were raised somewhere else, just because of the different climate and food. But still - I wouldn't mind trying to spin some of that beautiful fleece, especially if it doesn't felt. Excellent presentation of this valuable subject. Hey great lens. Who knew? Glad you saved these sheep. I'm very thankful for people who dedicate themselves to conserving and restoring rare breeds of animals. 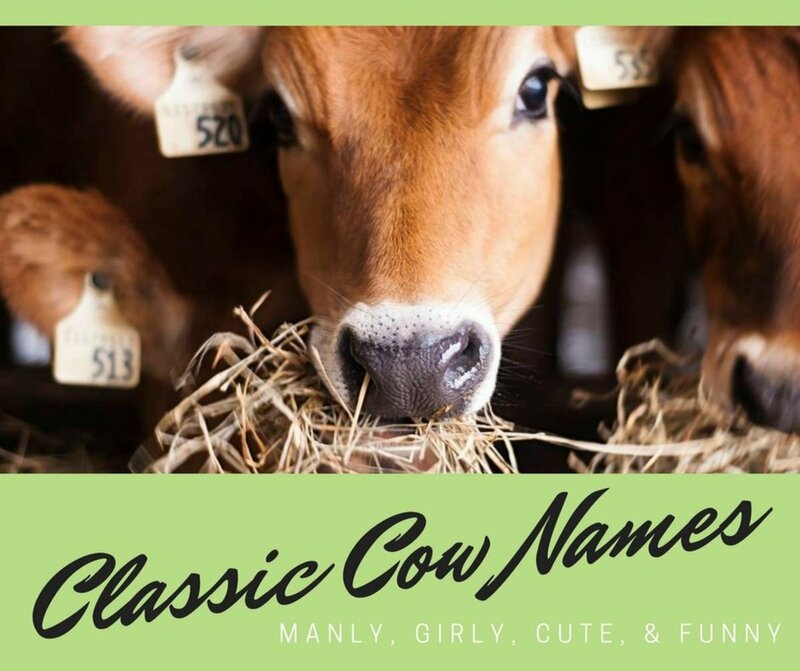 So many farms have gone to giant scale mono-cultures of livestock, allowing much of the wonderful diversity and strength of traditional and rare breeds of animals to die out. Thank you for preserving this useful, beautiful, and sturdy breed of Drenthen Moor Sheep! I love your sheep lenses. I live in Devon, England, in the countryside, so I've seen sheep all my life, but not been as hands on as you are. I do remember going around a flock with the farmer's daughter to check if any sheep were on their backs. I rolled one over myself. I love the photos where you can see the sheep blending into the landscape, they're the same color range. We've got sheep everywhere here. Our local breed is the herdwick. Hope it's not too cold for your lambing right now. @SandraWilson LM: The fleece of this breed is very long. It used to be used for making carpets. It has a thicker hair in it which we call 'kemp', looks a bit like a horse tail hair. It's very easy to spin, but that kemp might cause a bit of irritation when worn on your bare skin. This wool is mostly used for making felt. What a wonderful lens. I'll have to visit your other sheep lenses. You are a spinner, so what is the fleece like from this breed? They look like a tough breed. A great lens ! 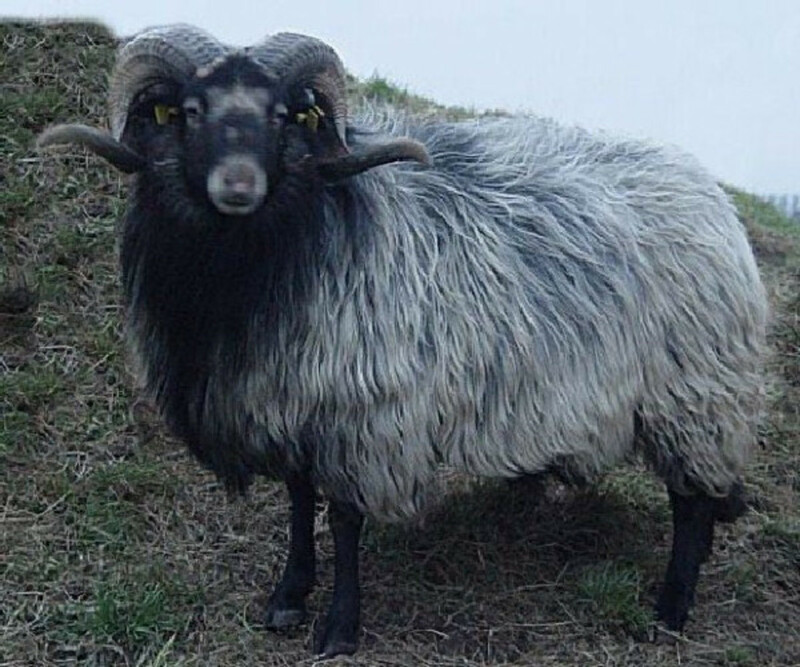 the Drenther Moor sheep looks cool. Another one of your fantastic lenses. Keeping sheep seems like pretty hard work although I wouldn't mind having a farm with them. I like sheep, and their environmental impact is so much lower than cattle. @Fiorenza: Oh that's very interesting too, didn't know they did that. I know the herdwick. Close to me just across the border in Belgium they have some. They're pretty sheep to look at with their white faces. Interesting to read about Dutch sheep. Here, the ones I know most about is the Herdwick, a beautiful sheep found only in the Lake District, and distinctive because it "hefts", which is an old dialect word meaning it is territorial so if land is sold with the sheep on it, the sheep must be included. Each ewe teaches its lamb the layout of the land and they "heft" and know that as their home. What a cool, interesting lens, and I love your pictures! 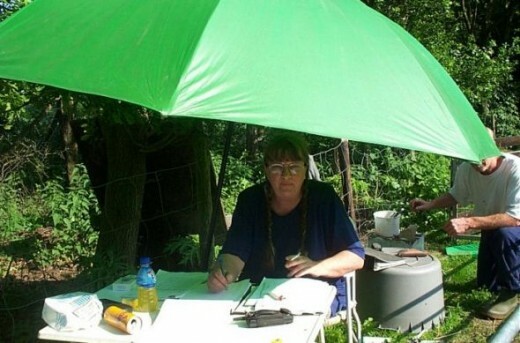 My husband and I lived on a farm for a while where we helped raise rare breeds of cows, pigs and chickens. The owners of the farm got some rare breed sheep just before we moved away, but I don't remember what type they were. The only sheering experience I've had, though, was with angora goats, and, wow, was that hard with their loose skin! Your sheep are beautiful, Titia!